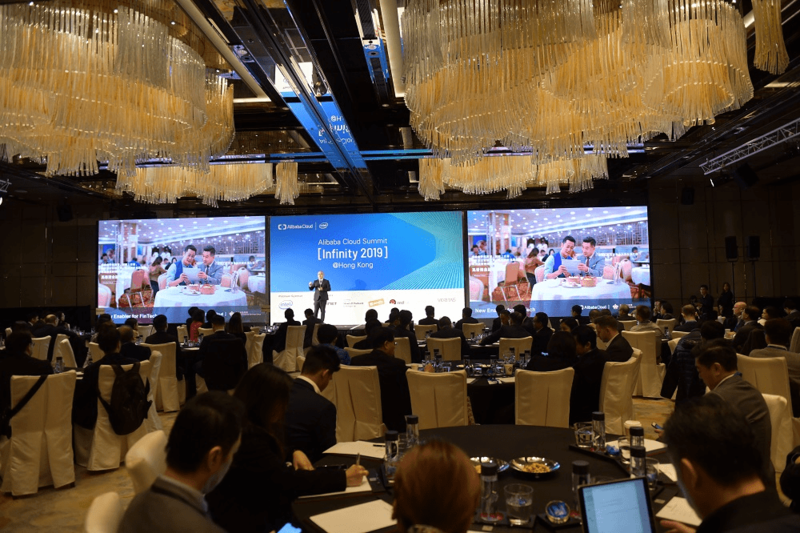 Hong Kong, January 17, 2019 - Alibaba Cloud, the cloud computing arm of the Alibaba Group, today showcased its latest cloud products that will enable Hong Kong's public and private sectors in the journey of digital transformation at its "Infinity 2019" Hong Kong summit. The full-day event featured insight and use case sharing from representatives within Alibaba Cloud's extensive regional partner and client network who have been actively involved in driving Hong Kong's smart city development while Alibaba Cloud's executives introduced the company's latest product and service offerings. "Alibaba Cloud harnesses technologies that tackle real-life challenges and improve the quality of modern living. We are committed to working with all our partners to drive digital transformation across various sectors," said Leo Liu, General Manager of Hong Kong, Macau and Korea at Alibaba Cloud. "Our products integrate capabilities in data technology, AI, machine learning and Internet of Things to provide comprehensive solutions that ignite innovation and enable public sectors, as well as businesses big and small, to thrive within the smart city infrastructure." At the event, Alibaba Cloud showcased its analytics and big data solution, DataV, which has recently been applied to help Hong Kong International Airport to monitor the passenger and road traffic inside the terminals and apron respectively. It visualizes traffic data on big screens and sends out timely alerts, enabling rapid analysis and response. "Hong Kong International Airport strives to leverage on latest technologies to develop into a smart airport. With the help of Alibaba Cloud's DataV, we are able to visualize and analyze the data, better deploy resources and hence enhance our operation efficiency," said Andy Bien, Chief Information Officer of Airport Authority Hong Kong. By integrating live dashboards, DataV is able to present various sets of business data simultaneously on a user-friendly interface. It features geographic information, allowing for the rapid interpretation of data to understand relationships, patterns and trends, as well as more effective data mining and analysis to uncover the full value of data. In addition to DataV, Alibaba Cloud's full range of products and solutions were showcased at the summit. A roadmap was also presented, showing how customers in the region will be able to choose products ranging from elastic computing to storage and content distribution network (CDN), database, blockchain, security, analytics and big data, networking and cloud communication, according to their specific business needs. Tailored solutions are also in place to support industries such as transportation, online education, franchises and smart logistics. For more information of Alibaba Cloud's latest product offerings, please visit: www.alibabacloud.com. Alibaba Cloud's service capability in Hong Kong has doubled since the company established its first data center in the city in 2014. It is now one of the largest public cloud providers in the region serving a wide range of clients. As part of its committed contribution to fostering a smarter Hong Kong, Alibaba Cloud also announced today that it will join the Smart City Consortium (SCC), a body that advises on Hong Kong's smart city initiatives. As a member of this professional organization, Alibaba Cloud will contribute its technological insights to improve urban infrastructure and standards of operations in the areas of mobility, security, energy and the environment. Established in March 2016, SCC is a platform that brings together international and local academic and research institutions, think-tanks, technology and industry associations, as well as businesses to provide advice to the government on the formulation of smart city policies and their effective implementation. Jakarta, Indonesia, January 9, 2019 – Alibaba Cloud, the cloud computing arm of Alibaba Group, today launched a second data center in Indonesia to double its local capacity. The company also announced the Internet Champion Global Accelerator Program at today's "Hello Indonesia 2019" event to empower local enterprises and talents, contributing to Indonesia's 2020 Go Digital Vision. Driven by strong customer demand, the opening of the second data center came only ten months after the first. Alibaba Cloud is the only global public cloud platform with local data centers in Indonesia. The two centers will provide high availability and strengthen disaster recovery capabilities, allowing customers to deploy mission-critical workloads in multiple availability zones and switch over within seconds. Alibaba Cloud now has 55 availability zones across 19 regions worldwide. The two centers offer a comprehensive suite of products and services, ranging from elastic computing, database service, networking, storage, security, and middleware, to solutions that address vertical industry challenges. With strong demand for big data and analytic solutions from Indonesian enterprises, Alibaba Cloud has already launched Machine Learning for AI and, later this month will offer elastic search to provide real-time search, data analysis, and visualization capabilities. Alibaba Cloud has also launched Smart Access Gateway (SAG), an SD-WAN solution to provide a one-stop cloud connectivity solution for public cloud and hybrid cloud environments. "The Digital Economy Vision of Indonesia sets out a clear direction for our future development. Our goal is to foster new decacorn and unicorn, accelerate the growth of at least 1,000 startups, and help at least 8 million people in the traditional farming and fishing industries, as well as SMEs, to go digital," said H.E. Rudiantara, Minister of Communications and Information of Indonesia. "With better connectivity and a fast-growing digital community, the Indonesian market presents enormous opportunities to both local and global enterprises," said Leon Chen, General Manager of Singapore and Indonesia, Alibaba Cloud. "By doubling our data center capacity and launching the Internet Champion Global Accelerator Program in Indonesia, we aim to further build the cloud ecosystem and talent pool for Indonesia." The newly launched Alibaba Cloud Internet Champion Global Accelerator Program echoes the Indonesian Government's digital ambition by providing training, mentorship, and venture capital opportunities to enterprises and professionals. Following its initial launch in Indonesia, it will gradually roll out to other global markets. Alibaba Cloud kicked off the program in Jakarta by giving 300 professionals from start-ups and enterprises an introduction to e-commerce technology, using Alibaba Group's Double 11 Global Shopping Festival as a case study. The accelerator program will go to Bali on January 12 to further connect with more than 200 professionals and students. Alibaba Cloud also continues to strengthen its local channel network with partners such as PT IndoInternet, PT Blue Power Technology and PT Sistech Kharisma. Today, Alibaba Cloud announced a strategic partnership with PT IndoInternet as the distributor of its full range of cloud computing products and services. "We are very pleased to work with Alibaba Cloud. Reliable and cost-effective products and services are highly sought-after in our market as it expands. Serving as a distributor of Alibaba Cloud not only helps us meet increasing market demand but also enables local resellers to improve their product knowledge and service standards," said David Tandianus, Director, PT IndoInternet. The University of Macau (UM) and Alibaba Cloud, the cloud computing arm of Alibaba Group, today (19 December) signed a memorandum of understanding (MOU) on a partnership to propel the development opportunities in big data and cloud computing technologies for UM students. The partnership will extend UM’s current offerings of technology-related courses and the development of laboratories to facilitate research in big-data processing, data analytics and collaborative computing, data-driven intelligence systems, and e-commerce technology. The MOU was signed by Yonghua Song, rector of UM and director of the State Key Laboratory of Internet of Things for Smart City; and Leo Liu, general manager of Alibaba Cloud Hong Kong, Macau and Korea. According to the MOU, UM and Alibaba Cloud will jointly launch a number of digitally focused initiatives, which will infuse innovative elements into emerging and fast-developing fields of technology. This approach will equip students with future-ready competencies and practical skills in innovative technology that can fulfil industry demands. UM will launch a new master programme in data science in the new academic year beginning September 2019. The courses in the programme will be taught by a team of instructors from Alibaba Cloud Academy. In his speech, Rector Song said that the MOU aims to deepen exchange and collaboration between UM and Alibaba Cloud in the areas of cloud computing, big data, and innovative technology. By making the most of the strengths of both parties, this act will help to accelerate smart city development in Macao, nurture multi-disciplinary and high-calibre professionals for the city’s development in smart city and innovative technology, and create a win-win situation. In his speech, Liu said that talent is one of the key factors in technological innovation, adding that Macao’s vision to speed up smart city development means an increasing demand for tech talent in the region. As general manager of Alibaba Cloud Hong Kong and Macau, Liu said that the company is pleased to work with UM and contribute their industry insights on nurturing the knowledge, skills, and mindset the world requires in young tech talent both now and in the future. He added that this act will not only help enable the success of young tech practitioners, but also help to make the world a better place with the use of technology. Alibaba Cloud and UM will co-organise different workshops, seminars, and activities to promote technology adoption and foster an innovative culture that will enable young talent to contribute to smart city development in Macao. The collaboration follows Alibaba Cloud’s earlier commitment to the development of local professionals as part of the strategic partnership between the Macao SAR government and Alibaba Group. Both parties are striving to drive Macao’s digital transformation through the application of Alibaba Cloud’s technologies. REDLANDS, California – Esri, the global leader in spatial analytics, announced on today(April 12, 2018) that it has entered into a Collaborative Agreement with Alibaba Cloud, the cloud computing arm of the Alibaba Group. This agreement will enable both organisations to deliver enhanced options to customers seeking to implement their Esri technology on Alibaba Cloud. Esri President and Founder, Jack Dangermond, described the agreement as both a recognition of successful implementations and a shared belief that location intelligence in cloud infrastructure was pivotal to addressing customer needs and solving real-world problems – especially those that need scalable computing, storage, and networking capabilities. As the cloud computing arm and the business unit of Alibaba Group (NYSE: BABA), Alibaba Cloud provides a comprehensive suite of global cloud computing services to power both our international customers' online businesses and Alibaba Group's own e-commerce ecosystem. Alibaba Cloud's International operations are registered and headquartered in Singapore, and the company has international teams stationed in Dubai, Frankfurt, Hong Kong, London, New York, Paris, San Mateo, Seoul, Singapore, Malaysia, Indonesia, India, and Sydney. Currently, more than one million engineers around the world are engaged in artificial intelligence (AI), and they are in great need of latest deep learning frameworks and convenient development environments. In the past, software integration jobs such as driver installation and library compiling are time consuming and labor intensive. Now, the GPU computing platform on Alibaba Cloud can work with NGC to significantly reduce the development environment provisioning time. NGC can help developers access deep learning containers for free. Deep learning frameworks, including Caffe, Caffe2, CNTK, MXNet, TensorFlow, Theano, and Torch, are pre-integrated, tested, and optimized for NVIDIA GPU, removing the need for manual integration. The NGC containers on Alibaba Cloud enable developers to quickly access deep learning frameworks, saving a lot of time in product development and service deployment. Users can establish their own AI applications by using Alibaba Cloud and NGC containers. Since 2015, Alibaba Cloud has launched a series of heterogeneous acceleration platforms for the Elastic GPU cloud computing service, to offer global acceleration capabilities for the AI industry in various scenarios. In November 2017, Alibaba Cloud launched GN6, the first instance with NVIDIA® Tesla® V100 GPUs in China, which improves the deep learning performance multiple folds. Now, several million developers are gaining their deep learning and AI development abilities by leveraging Alibaba Cloud. As AI has been industrialized, turning the latest AI technology into productivity becomes one of core demands of enterprises. To enable complex and cutting-edge AI technologies to be more widely used, Alibaba Cloud has launched various solutions such as the machine learning algorithm platform PAI and ET Brain while improving the cloud infrastructure. These solutions help enterprises innovate more easily, and enable computing and AI technologies to better serve people. Hong Kong, March 7, 2018 – Alibaba Cloud, the cloud computing arm of the Alibaba Group, today hosted the Alibaba Cloud Eco Summit Hong Kong 2018, to advance data technology development and drive new opportunities in the regional cloud ecosystem. This is the first time that this event has been held in Hong Kong, and the company marked the Summit by inaugurating the Alibaba Cloud Hong Kong and Macau Eco Alliance, an open program that provides enterprises across industries with access to Alibaba Cloud’s extensive suite of solutions and international partners. The one-day Summit, sponsored by Intel, attracted nearly 500 representatives from private enterprises, public institutions, technology developers, channel partners and startups. Speakers shared their insights on the current adoption and trends of cloud technology and the role they each play in the ecosystem ultimately hastening the digital transformation of the economy. Intel demonstrated Turbo Rack with the latest Xeon® Scalable Processors and the disruptive Intel® Optane™ technology which bring significant improvement to rack density, energy efficiency and performance scalability, and help cloud customers to achieve better TCO and user experience. The Hong Kong and Macau Eco Alliance will become the largest cloud ecosystem in the region with thousands of Alibaba Cloud’s partners and customers participating in a holistic range of expertise. This will include digital transformation in the vertical industries, academic research, technology innovation and marketplace enhancement. To assist enterprises by providing the tools needed for business growth and success in the digital era, Alibaba Cloud has invested substantial resources in building out a global cloud services network and digital infrastructure in Hong Kong and Macau. In addition to the two data centers already established in Hong Kong, this new regional Ecosystem Alliance can bring together corporates, distributors, developers, start-ups and training organizations onto one integrated and open platform. This will enable local customers on Alibaba Cloud to easily deploy cloud infrastructure as well as gain access to various technology partners worldwide in a convenient manner. Alibaba Cloud’s data storage and processing capacity in Hong Kong has doubled in the past four years since the company established its first data center in the city. It is now one of the largest public cloud providers in the region, serving a wide range of clients in aviation, finance, logistics, media and retail, including South China Morning Post, Cathay Pacific Airways, Pacific Coffee, I.T, PCCW Global and Equinix. Hangzhou, China, February 22, 2018 – Alibaba Cloud, the cloud computing arm of Alibaba Group, today announced that Red Hat Enterprise Linux, the enterprise open source operating system developed by the world’s leading open source solutions provider Red Hat, is now available globally in the Alibaba Cloud Marketplace on a pay-as-you-go basis, bringing more choice and flexibility to customers of both Alibaba Cloud and Red Hat globally. Red Hat Enterprise Linux provides a stable foundation for modernizing IT infrastructure, on which enterprises and developers can roll out new applications, virtualize environments and create a hybrid cloud to deploy Red Hat’s certified open source solutions. Users can also customize their versions with add-on functionality from Alibaba, including desktop options and developer tools. Alibaba Cloud and Red Hat entered into a collaboration to leverage each other’s infrastructure and solutions in October 2017. Since then, Alibaba Cloud has completed the certification process to officially become a Red Hat Certified Cloud and Service Provider. Being certified means that Alibaba Cloud is recognized as a provider that can offer a safer, scalable, supported and consistent environment for enterprise cloud deployments, as well as Red Hat-tested and validated open source solutions. Elastic, the company behind Elasticsearch, and the Elastic Stack, the most widely used collection of open source products for solving mission-critical use cases like search, logging, and analytics, today announced a new partnership with Alibaba Cloud, the cloud computing arm of Alibaba Group, to deliver a joint hosted Elasticsearch offering on Alibaba Cloud for the China market. Unveiled today during a keynote at The Computing Conference 2017, the new service , Alibaba Cloud Elasticsearch, will allow Alibaba Cloud customers to deploy Elastic’s powerful real-time search, ingestion, and analytical features as a hosted and turnkey solution. "As a leading global cloud provider, Alibaba Cloud always aims to offer our customers access to the most advanced products on our platform to give them a competitive edge and to spur innovation," said Yeming Wang, Deputy General Manager, Alibaba Cloud Global. "Alibaba Cloud Elasticsearch will be a highly differentiated service as it uses Elastic's advanced search product and powerful X-Pack features across every tier of our service in a way that is easy to get started, consume, and manage." Available immediately, Alibaba Cloud Elasticsearch can be accessed as a simple add-on to cloud computing services used by a customer. This new product will give developers a turnkey, hosted experience for embedding Elasticsearch's real-time search capabilities into their new and legacy applications, ingesting data into Alibaba Cloud Elasticsearch using Logstash or Beats, visualizing the real-time and historical data in Kibana dashboards, and automatically comes with Elastic's X-Pack features, such as security, alerting, monitoring, reporting, Graph analytics, and machine learning. Alibaba Cloud and Elastic will also work together on technical enablement, keeping the Alibaba Cloud Elasticsearch service up-to-date with the latest features, as well as making logging and other services available in the future. "China is a growing market for us, and over the past few years, we've seen the Elasticsearch community organically expand to more than 5,000 developers," said Shay Banon, Elastic Founder and CEO. "By partnering with China's largest cloud provider, Alibaba Cloud, we will be able to jointly accelerate the pace of innovation for China's massive developer ecosystem to build, host, and manage their applications with Elasticsearch's real-time capabilities and our powerful X-Pack features like security, alerting, and machine learning." Dr. Min Wanli, AI scientist at Alibaba Cloud, delivered a keynote speech, in which he talked about the past and present of Alibaba Cloud and the achievements that have been made in its strategic partnership with SAP. The number of Alibaba Cloud's paying cloud computing customers has crossed the 1 million mark. According to research firms such as Gartner and IDC, Alibaba Cloud not only is the biggest cloud computing vendor in China, but also takes a leading position in the world. Now the focus of the partnership is being shifted to external customers. The two parties will work closer on the AI area, in a bid to create more value for customers by speeding up their digital transformation initiatives. It is widely accepted that AI has the power to improve performance. How to harness AI to conduct market analysis and precision marketing has become a topic that CIOs think about. As noted by Dr. Min, Alibaba Cloud is looking to combine its big data and AI capabilities with the offerings from SAP, and thus to deliver smarter and more value-added business solutions to customers. Sun Yao, technical director at the business cooperation department of Alibaba Cloud, delivered a speech titled The Story between SAP and Alibaba Cloud. Since their strategic partnership was announced at The Computing Conference 2016 in April 2016, the two parties have been working closely in SaaS, databases, enterprise applications, and industry-specific solutions. Alibaba Cloud has been certified for SAP HANA, meaning that the customers can safely deploy and run their SAP HANA–based business systems on Alibaba Cloud. As part of the plan, Alibaba Cloud is also teaming up with SAP to facilitate the deployment of S/4 HANA ERP systems on Alibaba Cloud. With the combination of SAP's rich experience in enterprise management software and Alibaba Cloud's strengths in elastic scalability, rapid deployment, high stability, and global infrastructure, customers can easily adapt to business changes and deploy their business systems more quickly. This also helps maintain the continuity and stability of their business systems, and reduce the costs for running IT systems. During the two-day event, Alibaba Cloud attracted a large number of visitors to its booth. The enterprise-class SAP Hybris e-commerce solution was demonstrated and made a hit among the attendees. In E-Commerce systems, the system load is often distributed randomly, and there could be huge difference between the load peak and the load valley. The demand for high, dynamic scalability has always been the biggest pain point in building e-commerce solutions. This scalability is required not just for computing resources, but for middleware and relational databases as well. With that in mind, Alibaba Cloud has established a comprehensive partnership with SAP, which not only covers cloud infrastructure, but also security and middleware. It is hoped that Alibaba Cloud's proven technologies like Enterprise Distributed Application Service (EDAS) and Distributed Relational Database Service (DRDS) will be leveraged to bring the highest possible elasticity and scalability to SAP Hybris e-commerce systems, and thereby serve customers better. SAP's flagship products including SAP HANA One, SAP Cloud for Customer, and SAP Business By Design are now available in the Alibaba Cloud market. As the partnership goes further, more SAP enterprise applications will be made available on Alibaba Cloud to support the needs of customers. We are excited to announce Alibaba Cloud’s support for HashiCorp's core packaging and infrastructure provisioning tools - Packer and Terraform. Users can now use these tools to speedily deploy their applications and infrastructure on Alibaba Cloud. Customers across the world have adopted HashiCorp’s core provisioning tools to improve their application delivery workflows across heterogeneous environments. With the support of Terraform and Packer, Alibaba Cloud customers can have the same powerful workflows to manage their global infrastructure. As a result, customers can save time and cost on infrastructure management, and focus on delivering business-critical needs. Read on to learn more about the HashiCorp workflow for infrastructure automation on Alibaba Cloud. Haivision, a market leader in enterprise video and streaming solutions, announced that the Haivision Media Gateway is now available on Alibaba Cloud, bringing low latency, cloud-based video transport and distribution solutions to customers in China and APAC Markets. As the first of many Haivision solutions to be available on Alibaba Cloud, the Haivision Media Gateway helps broadcasters and enterprises easily and securely transport high-quality video over the Internet and corporate networks for live backhaul and distribution. An important component in Haivision’s suite of end-to-end video streaming solutions, the Haivision Media Gateway enables organizations to take video streams from one network environment and send them into any other network, including LANs, MPLS, satellite IP, and the public Internet. The Haivision Media Gateway is powered by Haivision’s SRT (Secure Reliable Transport) technology which optimizes live video transport across unpredictable networks by assuring quality-of-service when faced with packet loss, jitter, latency, and fluctuating bandwidth. The Haivision Media Gateway with SRT utilizes the Internet as a means to bridge facilities for live video transport, offering significant operational flexibility and cost savings over satellite or custom network infrastructures. Hangzhou, October 13 – At The Computing Conference 2016, Alibaba Cloud and Docker, a global leader in container services, reached an agreement on a strategic cooperation in the area of container service. With this partnership, Alibaba Cloud can now provide clients with even more advanced cloud application management services. With this partnership, both parties will work together to develop open-source container technology and to deliver localized Docker services to clients. Docker has chosen Alibaba Cloud to provide infrastructure services for its Docker Hub in China. Alibaba Cloud has also obtained the rights to operate the Commercial Docker Engine and the Docker Datacenter, and is bringing enterprise-class support and consultation services to Docker's clients. This partnership also makes Alibaba Cloud an official Docker cloud services provider. The Docker technology is one of the most popular open-source technologies in recent years. Docker is currently being used to transform the entire life cycle of enterprise applications – from development to build, release, and run. Previously, Docker has partnered with other technology giants, but Alibaba Cloud is Docker's first official partner in China. Alibaba Cloud began to provide container service in 2015, and has since then gained significant technical expertise and made sustained investments in container technology. Alibaba Cloud provides a diverse array of container-related solutions such as DevOps and microservices. This allows enterprise clients to achieve lower costs of maintenance as well as enhance delivery efficiency up to 13 times by upgrading their applications in a more reliable, efficient, and secure manner. With the "build once, run anywhere" feature of container service, Alibaba Cloud helps clients seamlessly migrate applications into the cloud environment. The introduction of services like Docker Hub to China will deliver a better experience to Chinese developers and facilitate the growth of China's technical community. Alibaba Cloud's powerful cloud infrastructure will greatly enhance the user experience of Docker Hub for domestic users. Beijing Genomics Institute (BGI) is currently making use of Alibaba Cloud's container service to build an application development and sharing platform for genetic data. Additionally, Nanjing Router Software Co., Ltd. is conducting its DevOps process using Alibaba Cloud's container service in order to provide SaaS services to its enterprise clients. The developers at Xueba100 are also deploying microservices and optimizing the DevOps process using the container service. "We are very happy to bring Docker's container technology, the Commercial Docker Engine, and the Docker Datacenter to China,” said Ben Golub, CEO of Docker. "We have chosen an industry-leading partner so that we will be able to provide even better services to our shared clients." "Through our strategic partnership with Docker, Alibaba Cloud will be able to provide enterprise clients with a comprehensive suite of cloud services, and empower our clients to realize the transformation made necessary by new technologies," noted Simon Hu, President of Alibaba Cloud. Shenzhen, China, April 20, 2016 - Alibaba Cloud, the cloud computing arm of Alibaba Group today announced plans to enter into a strategic partnership with SAP China, with a goal of jointly delivering enterprise-class cloud computing services to companies in China. The alliance aims to accelerate the introduction and adoption of enterprise-class cloud computing across multiple industries to help businesses accelerate their digital transformation. The partnership initially plans to focus on integrating the resources of Alibaba Cloud and SAP on the Alibaba Cloud platform. Businesses are expected to benefit from a versatile, one-stop-shop cloud computing environment that is enabled by Alibaba Cloud’s high-reliability and high-performance cloud infrastructure, SAP’s world-leading enterprise-class database and business application solutions and SAP’s software-as-a-service (SaaS) offerings -- all interoperating seamlessly. Alibaba Cloud intends to collaborate with SAP to jointly market and deploy SAP HANA One and SAP’s SaaS solutions, enabling businesses to reap the benefits of SAP applications and Alibaba Cloud’s powerful cloud computing resources more conveniently. Simon Hu, President of Alibaba Cloud said, "Alibaba Cloud is delighted to work with SAP on a strategic alliance that will help Chinese companies and businesses around the world in their transformation from Internet Technology (IT) to the emerging age of Data Technology (DT). Cloud computing has become the basis of a new economy based on data, driving technological innovations that push the traditional boundaries of business farther than ever before and creating greater value for all stakeholders. Together, Alibaba Cloud and SAP will seek to build a unified ecosystem that makes cloud computing more accessible to businesses and organizations everywhere and converts computing power into commercial benefit." Alibaba Cloud is one of the world's leading cloud computing platforms, and China's largest, with services covering more than 200 countries and regions. Alibaba Cloud provides cloud computing and big data services to more than 1.8 million users in the finance, transportation, genomics, medical and meteorological industries. In the course of service fulfillment Alibaba Cloud has handled challenging scenarios involving massive numbers of transactions with ease, including during the Tmall “Double 11” Global Shopping Festival and rail ticket sales for the Spring Festival on 12306.cn. Established in September 2009, Alibaba Cloud (www.alibabacloud.com), Alibaba Group’s cloud computing arm, develops highly scalable platforms for cloud computing and data management. It provides a comprehensive suite of cloud computing services to support participants of Alibaba Group’s online and mobile commerce ecosystem, including sellers, and other third-party customers and businesses. Alibaba Cloud is a business within Alibaba Group. Alibaba Cloud, the cloud computing business of Alibaba Group, China’s largest ecommerce company, became the latest major player to turn to GPUs to speed up its artificial intelligence efforts. Alibaba Cloud announced this week that it will work with NVIDIA to broadly promote the first GPU-accelerated, cloud-based, high performance computing platform in China. The Alibaba Cloud HPC service will give users access to NVIDIA Tesla K40 GPUs to power a range of HPC, AI and deep learning applications. Alibaba Cloud and NVIDIA will also establish a joint lab for research and technology development. The lab will provide Alibaba Cloud users with services and support to help them take advantage of GPU-accelerated computing to create deep learning and other HPC applications. Founded in 2013, Zhuyun is a leading cloud services provider in China and a trusted partner to 2,000+ organizations. As an Alibaba Cloud Premier Partner, we are dedicated to helping clients achieve their business and IT objectives utilizing Alibaba Cloud products and services. Our own services include Cloud Strategy, System Architecture Design, System Migration, Deployment, 24/7 Monitoring, Maintenance, Business Solutions, Hybrid Cloud Management, and more. Whether you’re completely new to Alibaba Cloud and need guidance on how to begin your cloud journey or already have an Alibaba Cloud environment that you wish to optimize, we are here to help. With the rapid development of technology, more and more of our clients are looking for new and cost-effective approaches to access IT services. Our clients not only realize the transformational potential of cloud computing - whether it's moving into new markets, launching new products, or improving IT efficiency - but they also acknowledge the complexity of migrating to the cloud. This complex process includes significant implications to the client’s business operations and IT infrastructure. Under such circumstances, Zhuyun needs to develop new business models and cloud-based solutions to meet clients’ growing needs. Zhuyun has a valued and long-term partnership with Alibaba Cloud that dates back to 2009 when Alibaba Cloud first launched. Since this time, we have focused on growing our technical competencies to complement Alibaba Cloud’s own technological advancements. The reason we choose to work with Alibaba Cloud is their status as China’s largest and most advanced cloud computing platform, their extensive and proven expertise, along with their 2.3+ million customers and 500,000+ paying customers. In this regard, Alibaba Cloud holds a very clear advantage. As an Alibaba Cloud Premier Partner, Zhuyun offers a range of software solutions to sellers (or ISVs) of all sizes, such as Standalone Deployment (Image, Docker, and Resource Orchestration), Application Software (SaaS), PaaS (API), Manual Service Products (services with supervised templates). Our flagship store on the Alibaba Cloud Marketplace will help to extend our sales channels and offer powerful technical, business, and marketing support to help our partners establish, manage, and grow a successful business on Alibaba Cloud. With technological support from Alibaba Cloud, Zhuyun has helped more than 2,000 clients rapidly implement new services. This frees up customers to focus on their core business rather than be impeded by IT obstacles. Our experience with 2,000+ clients has also helped improve our own technological capabilities and ability to serve complex cases. The cost-saving integration process of our services, as well as our customer service ensure strong support for our partners. At present, we have launched 80+ images and 20+ SaaS products on the Alibaba Cloud Marketplace. Meanwhile, we have recently been working with a leading USA ITSM company to build an Alibaba Cloud-based SaaS product offered on Marketplace. End-users can buy from Alibaba Cloud Marketplace and use this software on their site. In addition to being an Alibaba Cloud Premier Partner, Zhuyun is also an authorized Alibaba Cloud Service and Training Center. This demonstrates Zhuyun’s unrivaled commitment to delivering excellence and leveraging the latest capabilities from Alibaba Cloud’s technology suite. We have full confidence in our promising partnership with Alibaba Cloud. The agility, elasticity, and efficiency delivered by Alibaba Cloud will provide a huge benefit to our entire product platform as we constantly upgrade our cloud-based services.